For the sixth day of our 31 Days of Pink extravaganza with essie cosmetics, we created a chic adaptation of the Ikat prints we've added to our wardrobe and home decor recently. 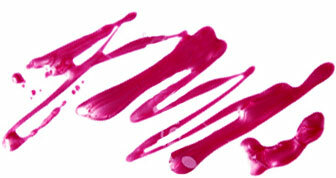 To get this look, start by painting your nails with a bright pink shade. Then, paint random spots on the nail with a pastel blue shade. It doesn't have to be perfect! Next, take a black striper polish and swipe lines all around your spots. By doing it carelessly, the black stripes will look as if they are smearing across your nails. Finish it off with your favorite top coat.